Wind can be unpredictable and powerful, and is a significant contributor to damaging roofs, especially in the case of strong, sustained winds and wind gusts. How much wind it takes to cause damage depends on the roof’s installation, age and general condition. The Haag Certified roofing inspectors at Texas Traditions Roofing can provide you with a free roofing inspection for wind damage and act as your roof repair company. Wind damage tends to occur low on the roof and up high near the peak. It may range from only a lifted shingle or two, to large sections of shingles blown off. If you neglect even a seemingly minor issue, you run the risk of increasing the damage to the roof as well as the chance for water damage inside your home. Texas Traditions Roofing is licensed, insured and Haag Certified – which means we can spot more wind damage than the average roofer. 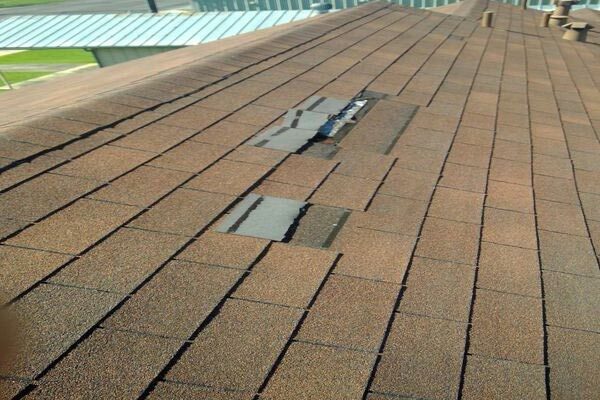 Because we’re an experienced roof repair company, anytime we undertake a roof repair, we use the proper tools and techniques. Hurricane-strength winds. No matter the age of the roof or how well-installed, winds over 130 mph will destroy most any roof. An aging roof. As your roof ages, shingles break down and the nails have less to hold onto. An aging roof may fail in winds less than 100mph. Improper installation. This can include bad nailing (not enough nails, incorrect placement, overdriven nails, wrong type of nails, etc. ), shingles not sealed properly at the eaves and rakes, and breaking the seal between shingles and not applying new sealant. Manufacturing issues. This is the rarest reason for wind damage but does occasionally happen. Trees. When tree branches rub on the roof, they break down the shingle. They may even catch under the shingle edge, which provides just enough lift for wind to get underneath and tear the shingle off in a strong wind gust. Let Texas Traditions Roofing put your mind at ease regarding wind damage assessment and repair. Contact us for a free inspection by filling out our contact form or calling us at (512) 415-4590.